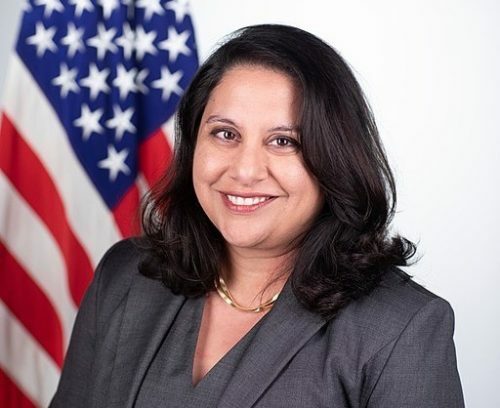 Neomi Rao, is undergoing hearings this week ahead of a possible confirmation to the U.S. Court of Appeals for the D.C. Circuit Court, taking the seat on that court vacated by Supreme Court Justice Brett Kavanaugh. Her nomination won’t go without a fight, as several rights organizations have stepped up against the nominee, pointing to her long history of statements opposing to the rights of minorities blaming victims for their own sexual assaults. “The Rao nomination is an insult to communities of color, women, persons with disabilities, and the LGBTQ community. In truth, the nomination is an insult to all Americans,” said NAACP President Derrick Johnson. Rao attempted to walk this back during today’s confirmation hearing, saying, “I cringe at some of the language I used,” but still contending she was attempting to make a “common sense” statement that women should take steps to protect themselves from sexual assault. “Her controversial writings set the stage for the damage she has done as President Trump’s Administrator of the Office of Information and Regulatory Affairs (OIRA), where she has led the Trump administration’s aggressive regulatory agenda to undermine civil rights and public protections,” Gupta added. Lambda Legal heightened Rao’s use of offensive racial slurs, such as referring to people as “oreos” in past writings. “Neomi Rao lacks the judgment and credibility to be an independent and impartial judge on any court,” said Legal Director and Chief Strategy Officer at Lambda Legal, Sharon McGowan. “Her use of racial slurs and her early writings on sexual assault, diversity, and marriage equality should immediately disqualify her from any nomination for a lifetime appointment, just as they have for other nominees. In today’s hearing, Rao was unwilling to say that Brown v. Board of Education, a landmark case that ended school segregation, was correctly decided. She also refused to speak to her views on Griswold v. Connecticut — which struck down a law that criminalized the use of contraceptives — or Roe V. Wade. The Alliance for Justice has also spoken out about the confirmation, with AFJ President Nan Aron paying close attention to her statements on sexual abuse. In April of 2017, Rao was nominated by President Trump as the administrator of the Office of Information and Regulatory Affairs (OIRA) within the Office of Management and Budget. She has never had to try a case in front of a state court nor a court of appeals, and has not previously served as a judge. Trump initially nominated Rao to replace Brett Kavanaugh in November of last year, but her nomination was returned to the president at the adjournment of the previous congress. He re-nominated her on January 23. As of that date, the administration has confirmed 85 judges, including two Supreme Court Justices. The majority of these have been extreme-right voices.